4-40 taps for a 30 mm cage system. Our LSKGG4(/M) Galvo-Galvo Scanner contains two galvo scan mirrors that deflect an incident laser beam in X and Y. Identical to the galvo-galvo scanner used in our Bergamo® II multiphoton microscopes and complete Cerna®-based confocal systems, each mirror has a mechanical scan range of ±7.5°, corresponding to an optical scan range of ±15°. This range is large enough to explore the entire diffraction-limited FN20 field of view of Thorlabs' SL50 scan lenses for laser scanning microscopy. A National Instruments (NI) 68-pin connector is available to directly control and monitor the scanner via an NI card or breakout box (not included). The beam can also be steered by supplying DC, sine, or sawtooth wave drive signals through two BNC connectors. For sine wave signals, a maximum scan rate of 500 Hz is supported. Two additional BNC connectors provide X and Y position feedback signals. This scanner is also compatible with Vidrio's ScanImage software. Each scan mirror has a protected silver coating that provides high reflectance in the visible and NIR; see the Specs tab for details. Since the coating is metallic, its performance varies minimally over the ±7.5° mechanical scan range of the mirror. 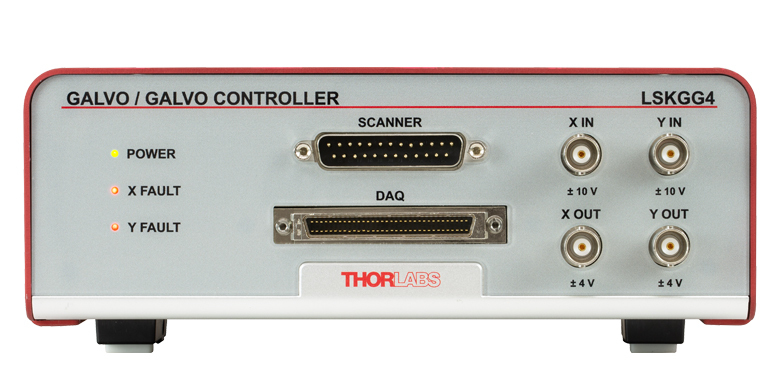 The scan head is connected to the controller using the included DB25 cable. If using the BNC input connectors to drive the galvo mirrors, a drive voltage of ±10 V at an impedance of 200 kΩ will be required for each axis. The BNC output connectors have a voltage range of ±4 V and an impedance of 2 kΩ. The LSKGG4 galvo-galvo scanner can be incorporated into a DIY laser scanning microscopy setup. The input face of the scan head has internal SM05 (0.535"-40) threads, internal SM1 (1.035"-40) threads, and four Ø6 mm bores spaced for our 30 mm cage system. The output face has internal SM1 threads and four 4-40 taps for our 30 mm cage system. Please note that the scan lens needs to be positioned such that its entrance pupil is at the midpoint between the galvo mirrors; when being used at the input, the distance is 27.255 mm, while at the output, the distance is 29.045 mm. For the CLS-SL Scan Lens, an LCP02(/M) Cage System Size Adapter can be used to convert the 30 mm cage system to a 60 mm cage system to mount and position this scan lens at the correct distance using a LCP8S Cage Plate. To mount an SL50-CLS2, SL50-2P2, or SL50-3P Scan Lens at the correct distance from the scanner a special adapter is available by contacting Tech Support. The scan head weighs 0.56 kg, so it may be useful to support it directly using a Ø1/2" post or Ø1" post. Four 1/4"-20 tapped holes (M6) are located on the bottom. A typical reflectance curve is shown to the right. The X and Y mirrors are denoted in the schematic to the right. The system noise is less than 16 bits over a full voltage range (-10 to 10 V). Response corresponds to a 0.1° movement from 1% to 99% of its final position. This is the maximum incremental movement at which the mirrors are able to settle within 130 μs. For movements greater than this, add a slope (Δv/Δt, where v is the difference between the voltages and t is the time difference) to your voltage profile. For example, for a step angle of 1.3°, the settling time is 260 μs. Bandwidth measured for a ±10 V sine wave. Results vary depending on the waveform chosen. Please note that lot-to-lot variations will occur in the reflectance. The table to the left contains minimum average reflectance values over the recommended wavelength range. 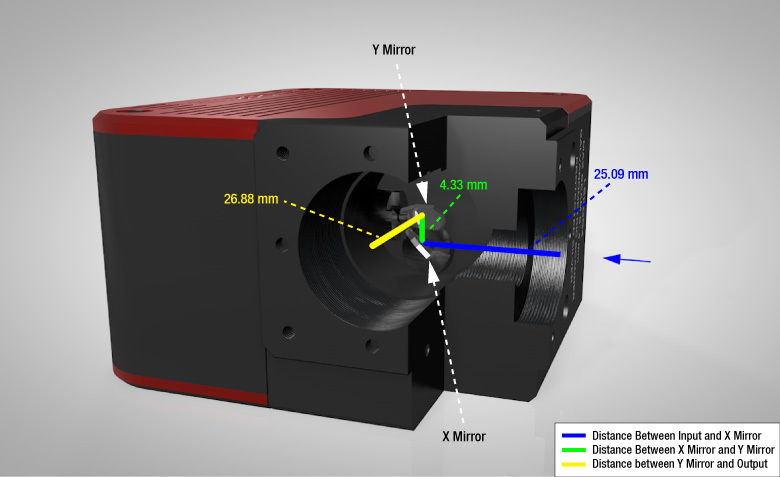 The scan lens being used with the scan head needs to be positioned such that its focus is at the midpoint between the X and Y Mirrors. The distance between the mirrors is indicated by the green line. For the input, that distance corresponds to 27.255 mm, while for the output, that corresponds to 29.045 mm. The input port has internal SM05 threads, internal SM1 threads, and four Ø6 mm bores for a 30 mm cage system, while the output port has internal SM1 threads and four 4-40 taps for a 30 mm cage system. The front of the controller has a DB-25 connector for the scan head, as well as BNC connectors and an NI 68-pin connector for position control and readout. The back of the controller has a USB port to control the resonant scanner of the scan head, as well as a fuse holder, power switch, and grounding pin connector. Bandwidth measured for a sine wave with 10 V amplitude. Results vary depending on the waveform chosen. 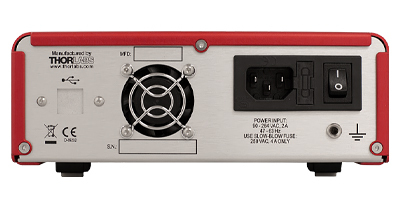 * The impedances listed in the table below are provided for cases where the connector is used a non-NI DAQ card or function generator. They do not need to be taken into account if an NI cable is used to connect directly to an NI card. Note because the galvo-galvo scanner can be steered using multiple methods of input signals, neither BNC cables nor an NI 68-pin cable are included. Dear Tech Support, could you, please, highlight the differences of LSKGG4/M compare to 'an ordinary' GVS002 XY-galvo set? One obvious thing is an easy integration into a cage system. What are the other key benefits which are included in 5 times higher price? Thanks for your feedback! Thank you for contacting Thorlabs. For a few key advantages, the LSKGG4/M offers a faster max full angle scan rate (500 Hz vs 250 Hz for a sine wave input), a faster small angle step response (130 µs vs 300 µs), better repeatability (within 8 µrad instead of 15 µrad), and overall a more user-friendly design ready for plug-and-play use. It has a National Instruments 68-pin connector for direct control from an NI card, and it is also compatible with Vidrio's ScanImage software. We will reach out to you directly to see if this product is best suited for your application. Hello. I want to know whether the resonant mirror's scanning velocity is variable or not. The scan velocity is variable from 0-500 Hz. Is the LSK-GG galvo mirror system operated at a closed-loop condition? For a small angle (±0.2°), what is the (small angle) step response and what is the maximum scan frequency or (small angle) bandwidth? What is the angular resolution? Thanks. 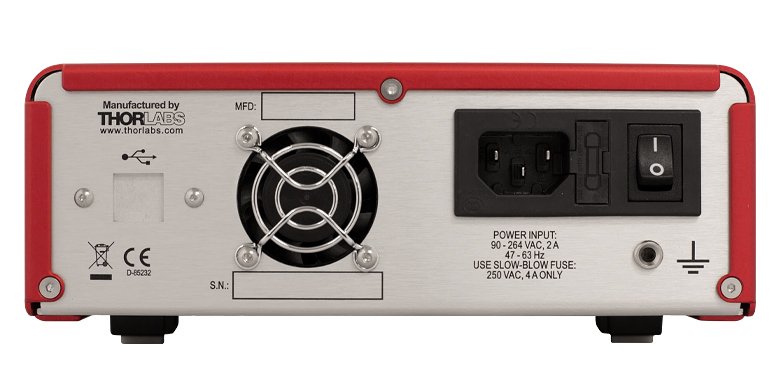 The LSK-GG allows customer access to all input and output signals to the galvos. It is completely up to the customer how they want to drive the mirrors. The kit is merely the galvos with controllers. Any interfacing with a DAQ card/system will have to be done by the customer. For closed-loop operation, the customer would have to write their own script. ThorImage, for example, drives these in Open Loop mode, that is, it doesn’t look at the encoder signal from the mirrors. It just feeds a sinusoidal wave to the mirrors so that they scan the field of view. https://www.thorlabs.com/newgrouppage9.cfm?objectgroup_id=10647 On the Specs tab we have the Small Angle Step Response to be 130us (Typical). The response corresponds to a 0.1 deg movement from 1% to 99% of its final position. The Specs tab also mentions a bandwidth of 500Hz for full swing (-10V to 10V or -7.5 deg to 7.5 deg mechanical). Dear Thorlabs, could you tell me the damage threshold for LSK-GG? Is the optical scan range of LSK-GG dependent upon the input beam size? I also would like to know the diameter of the view field (field of view) for LSK-GG with SL50-CLS2 scan lens at the intermediate image plane. I will use the NI 68-Pin connector of the controller for position control and readout so how could I put 200 kΩ resistors in pin 21 and 22 positions (between NI 68-Pin connector of the controller and NI SHC68-68-EPM cable)? Or 200 kΩ resistors were pre-installed inside the NI 68-Pin connector of the controller? The same question for 2 kΩ in pin 26, 28, 30, 57, 60 and 65. Why is the price of LSK-GG so expensive compared to that of GVS002/M? 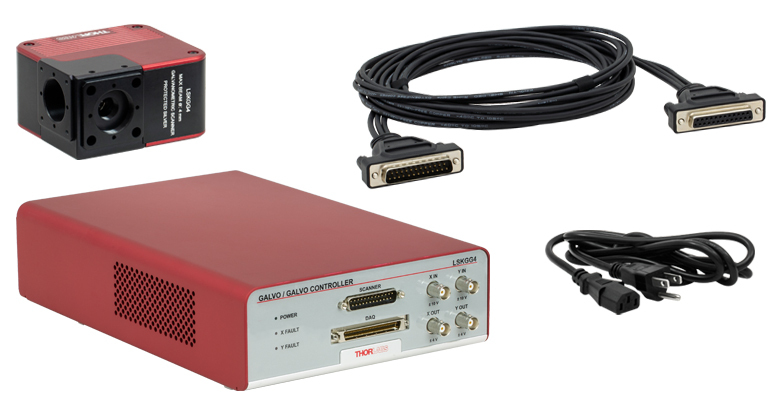 Could you provide special offers or bundle deals for such complete system package (LSK-GG + SL50-CLS2 + TL200-CLS2)? Thank you. Thank you for contacting Thorlabs. At the moment we do not have a damage threshold specification for the LSK-GG but they are intended to be used with ti sapphire lasers up to 1 watt CW power that fills the clear aperture. The SL50-CLS2 has a smaller optical scan angle we also have the CLS-SL if you need a larger field of view. The field of view will be close to the size of the image at the focal plane, but if you want diffraction-limited performance, you must limit the input to be within the below field of view: 23.8 x 23.8 mm2 The scanner is meant for a Ø4mm beam or smaller but the scan range is not dependent on the input beam size. SL50 scan lenses have a smaller FOV. We have the CLS-SL if you need a bigger FOV. 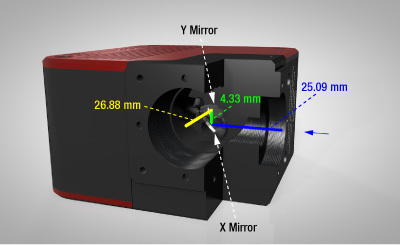 The field of view will close to the size of the image at the focal plane, but if you need diffraction-limited performance, you should limit the input to be within the field of view: 23.8 x 23.8 mm2 The price of the LSK-GG compared to the GVS galvo units is significantly higher because the GVS series are more intended for OEM applications and also do not support a simple plug and play configuration like the LSK-GG. A Techsupport representative will contact you directly with more information.